Business View Caribbean profiles USVI Water & Power Authority, an autonomous governmental entity that distributes electricity and potable water. 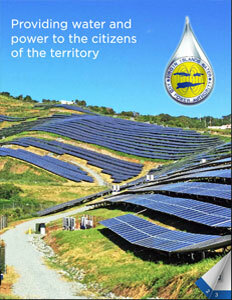 The Virgin Islands Water and Power Authority (WAPA) was created by the Virgin Islands Legislature in 1964. Its purpose was to produce and distribute electricity for homes, businesses, and all institutions of government across the territory, including: St. Thomas, St. Croix, St. John, Water Island, and Hassel Island. In 1987, the responsibility of producing and distributing potable water was added to WAPA’s portfolio. Finally, in 2001, the agency was further charged with the task of installing and maintaining street lighting in the territory’s urban and rural residential sections. As a semi-autonomous government agency, WAPA is considered a not-for profit public corporation that contributes directly to the Virgin Islands Government’s budget through an annual payment in lieu of taxes to the Virgin Islands Treasury. Today, WAPA provides electricity to approximately 55,000 customers territory-wide. The utility operates seven generating units on St. Thomas and six generating units on St. Croix. Customers on St. John are provided power from St. Thomas through underwater cables with back-up power available from an emergency generator. Electric rates are set by the Public Service Commission of the Virgin Islands. When all of these processes, upgrades, and conversions are finally operational, Hodge believes that the U.S. Virgin Islands will be a world leader in combating its dependence on fuel oil. “By adding flexibility to the system and the aggressive nature in which we’re bringing renewables onto the grid, you’ll see some of the highest percentages of peak, here, that you’ll see anywhere,” he states, proudly. “When you take our net metering and what we have grid-tied – that’s 20 percent of peak, or 23 mega-watts of our system which is peaking at 110. That’s unheard of in most places. And we’re going to double that,” he adds. In fact, WAPA is an integral part of the Virgin Islands’ efforts to reduce fossil fuel usage in the electricity and transportation sectors by 60 percent by 2025. Lastly, Hodge also talks about WAPA’s water system and plans for its improvement: “The water is all desalinized,” he says. “We recently converted all our de-salinization plants from thermal to reverse osmosis, so the next big thing for the water system is an upgrade of all of the transmission and distribution pipes. The lines are 70, 80 years old. Some of them have some rust; or the lining is gone. That will be a big, multi-year project – somewhere between $300 and $800 million, territory-wide.” Hodge believes that the system upgrade will improve water quality and virtually pay for itself by reducing water loss and the need to flush the system so frequently. As WAPA begins its second half century, the people of the U.S. Virgin Islands can be sure that their public utility will continue its ongoing mission of bringing “dependable, reliable, and cost-effective water and power to the citizens of the territory.” Hugo Hodge, Jr., WAPA’s nine-member board of public and private sector members, all of its business partners, and its almost 600 employees will see to that. FirstBank – First chartered in 1948, FirstBank was the first Savings & Loan institution established in Puerto Rico. In 2002, FirstBank acquired Chase Manhattan Bank operations in the Virgin Islands, and in 2008, it purchased the Virgin Islands Community Bank, becoming the leading financial institution with the largest Branch and ATM network in the region. Today, FirstBank offers checking and savings accounts, personal loans and credit cards, and mortgage and auto loans to its individual customers. For its commercial clients, FirstBank offers business loans, lines of credit, and real estate financing. Other services include life, property, auto, and commercial insurance, as well as online and mobile banking. www.1firstbank.com/vi/en.